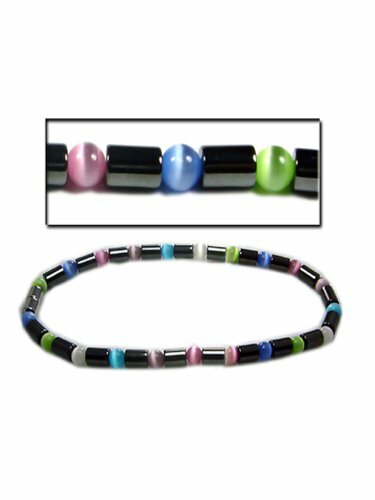 Accents Kingdom introduces a fashionable lady's magnetic hematite color cats eye anklet, the piece is set with multicolor light blending fiber optical "cat's eye" beads and magnetic hematite cylindrical beads. Each magnetic hematite cylindrical bead measures Approx. 600-700 gauss magnetic power and 1/4" in width. Great unique gift idea for Christmas, Birthday, Valentine's Day or just any occasions! Finish: Gun Metal Polished Black, Size: 1/4'' W, L: 10"
If you have any questions about this product by Accents Kingdom, contact us by completing and submitting the form below. If you are looking for a specif part number, please include it with your message.